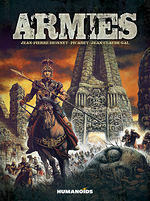 A collection of stories featuring an unstoppable army and an indomitable hero, all set amid the backdrop of barbaric and medieval lands. 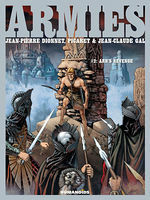 Jean-Pierre Dionnet, one of the founders of "Metal Hurlant," started a new genre in comics when he collaborated with artist Jean-Claude Gal ("Diosamante") in the late 1970s: Heroic Fantasy. It shortly thereafter gained the favor of the public and has since grown immensely. This is the occasion for all lovers of the genre to return to its roots. Witness, with the help of Gal's intricate style, the devastating effects of war as you follow an army's forward progress, and then join Arn's bloody quest for revenge. The result is very atmospheric. 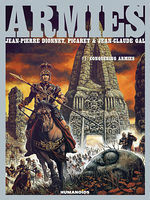 It’s astonishingly rare that the art alone is genuinely worth the cover price without even considering the accompanying story, but Armies is that book. It’s possible to study it for hours without even considering the plot. 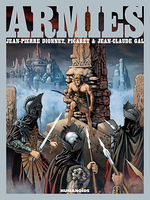 If you’re a fan of fantasy comics, this is arguably one of the definitive fantasy comics of the last few decades so reading this one is a no brainer. But if you also want something with a horror tinge and some dark bleak stories that as Mills says “superbly show the follies of warriors and the reality of war,” this is must read stuff. "Gal creates whole worlds and environment reach in details – a huge shot of forest spares no single leave even in the most distant tree, every soldier uniquely scarred, and every armor differently chipped and battered." 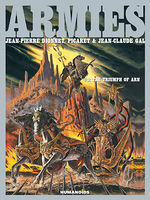 "Armies appears just as fresh today as it did when it debuted in the premiere issue of Metal Hurlant. In fact, given the production values which Humanoids has poured into this book, it is a fair guess that it may even look better today than ever before!"